Nell was having none of it. Not anymore. 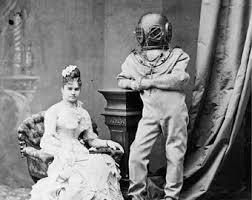 Her husband simply refused to even try to breathe air. The doctor said he could, that his lungs could adapt to this environment, but he disagreed. Trouble was, he’d never know unless he tried. Elowyn had read about other Marenians who had converted to air breathing. He’d never met one, of course. How could he? There were only three who lived in this state, and the closest was two hours away by plane. No airline would let him on a plane with his argon suit, that was a given. Their fears were unproven, but policy was policy. They’d met three years ago at the landing site. She was a reporter, alerted by the scanner in the office that something was coming from the skies again. That scanner was worth its cost from all the leads it provided. Quick as a wink she was downstairs and in her car, trying to not drive off the road as she followed the plumes of green clouds stretching like a tightrope from the eastern sky to some nearby cornfield – Mr. O’Reilly’s, most likely. He had the biggest one, so it stood to reason. She turned down Ellis Way and got there before the locals did. Farmers listened to the scanner same as reporters did, and for much the same reason. It was the best way to know what was going on that might be of interest. Something like this would pull them out of their barns for sure. Just think of it! Aliens! Here! In Mill City! Nell had guessed the pod’s trajectory right and reached the small crater it created just after the police had gotten there. The ground was still steaming next to the blue (metal?) craft. She noticed that there was a bright iridescent sheen across the pod’s surface, reflecting the late afternoon summer sun, as well as a distinctive sharp smell much like ammonia, but she couldn’t quite place it. They didn’t know at the time but it turned out that the color and the smell were both hallmarks of the Marenians. They both came about because their ships were alive, growing out of the same stuff as the people. This way they could self-repair. It saved a lot of money and time that way. It worked perfectly as long as they stayed in the Marenian solar system because the elements were more or less the same throughout. Earth, however, was another matter entirely. The stresses of the previous crashes had resulted in every pod going into automatic repair mode, sending wispy tendrils into the soil to gather the raw materials needed to boil up replacement parts in the integral kitchen/lab. Three minutes after the tendrils went down, they came back up, spit out what dirt they’d sampled, and retracted back into the beetle-like shell, refusing to budge. The self-preservation instinct was the strongest one, so the pods calmly explained in their proto-language to the pilot inside them that the soil was not compatible with their electrochemical makeup, so repairs would not be forthcoming. As trained, each pod then sent out a trans-space summons for another pod to make the trek to bring dirt from home so repairs could proceed. The only problem was that these supply pods came and they too became stranded. They’d underestimated the amount of dirt needed for the repairs. The pods were small, with barely enough room for the pilot. Even if they were able to navigate without a pilot there still wouldn’t have been enough room for dirt to repair both ships. No matter – flying without a pilot wasn’t an option. Each pod was raised with its pilot from the moment s/he was formerly admitted to the astro-nav program. Saying that they were synchronized wasn’t the half of it. Cells were harvested from under the tongue of the pilot and cultured over three weeks, growing into a ship that learned as the pilot learned. This was no simple cloning. The two beings were separate in body only. All past, present, and future were shared. This created a dilemma when the pods, and thus the pilots, began to be stranded. Without hope of repair, the pods chose to self-terminate, opting for a quick death over a slow lingering one. The pilots had to be tranquilized before the pods could self-euthanize. Otherwise it would have been too painful for them to endure. Some later, once they’d learned the local language, said it was like amputation of half your limbs and your brain. Many were encouraged to adopt dogs afterwards as the closest Earth option to the deep connection that they had shared with the ships. Nell had worked closely with Elowyn after the crash, helping him to adjust to Earth living. There was no going back to Marenia, so he had to learn a whole different culture. This was made easier because of his astro-nav training, but it was still understandably difficult. She’d not planned on adopting a stray, but the Mayor assured her that she was the most qualified person in the city for the job. Simply being a reporter, curious about new things, made her ideal, he said. Put that way, how could she refuse? It was a high honor to be deemed worthy of helping a stranded Marenian. You were serving as an ambassador for the whole planet, after all. The future of the relationship between the two solar systems would be created from these one-on-one relationships. It was about a year later that they both realized that they were quite compatible together and decided to formalize their pairing. Fortunately for them, other human-Marenian pairs had formed before they had even met, and laws had been changed to allow for interspecies marriage. There was only one difference with these marriages and all others – one member of the union had to be sterilized. Doctors weren’t comfortable with what could happen if a child was created. There was no way a child could have been created in the case of Nell and Elowyn. He was still hermetically sealed inside his argon suit. He had to have it to breathe on Earth, he insisted. The material in the suit was fortunately impervious to decay, or he would have a more difficult time of it. Nell was quietly upset when she learned this, hoping that he’d eventually be forced to adapt to Earth ways. She loved him, of course, but she thought that things would be better for both of them if he didn’t wear that darned suit. It made going out to visit friends awkward. Plus, the smell took some getting used to. The ammonia-like smell was a byproduct of the impervious material. It was unnoticeable on Marenia, but on Earth it alerted others that there was a foreigner around even before they saw him. It made some people not want to deal with Marenians at all, saying that they smelled like used gym socks. Nell and Elowyn mostly kept to themselves at home when she wasn’t working. He didn’t have to work – none of the stranded pilots did. They didn’t need food, and they weren’t interested in owning anything. If they couldn’t carry it, they didn’t need it – this philosophy was part and parcel of being a Marenian. It was how they had finally adapted to a planet with too many people and not enough land. They didn’t even need to live in homes anymore, having selectively bred themselves over twenty-three generations to be unaffected by temperature changes or ultraviolet rays. Some did live in homes on Marenia out of habit or convenience, and most pilots on Earth did as well, but it wasn’t uncommon to see one hanging out with homeless people under overpasses or near street corners. They were comfortable wherever they happened to be. The Marenians got along with the homeless population uncommonly well. They had in common their philosophy of “less is more”, albeit perhaps unwillingly for some of the homeless. Soon the Marenians and homeless had developed a spiritual system – not a religion – about this, encouraging others to get rid of their addiction to things. They explained that there was a reason that the Earth language used the word “possession” to refer to things as well as being taken over by demons. It had to be a spiritual system because a religion would require stuff – books or buildings, for instance, and this was totally opposed to their beliefs. Of course, many years later, after the founders had died and no more new Marenians came to Earth, their simple way was converted like all other spiritual paths had been and there were not only cathedrals to “less is more” but also gift shops with plastic trinkets made in China. This entry was posted in Stories and tagged alien, black and white stories, possession, short story, spirituality. Bookmark the permalink. You are welcome. I keep finding these pictures that keep needing back stories. So thanks to whoever posed and photographed and posted them originally. It is almost easy after that. I guess it is like making soup – start with good ingredients and it all comes together.